Let’s start with the most famous! Edinburgh Castle is reputed to be among the ‘most haunted’ places in Scotland, and one of its inhabitants is said to be a lone piper. A story tells that, centuries ago, some mysterious underground tunnels were discovered and a young lad was sent to find out where they went. He took his bagpipes with him, so that those above could hear him playing and monitor his progress (I’m not sure about the logic of this at all). When the playing stopped, the people who had sent him were obviously struck with a rather late sense of guilt, and went to look for him. He had vanished. However, the strains of his pipes can still be heard occasionally, playing underneath the castle. And then there’s the drummer… One night in 1960, a sentry on duty outside the castle heard the sound of drumming. He turned and saw a figure standing on the ramparts. The figure was, unfortunately, headless. Nevertheless, it turned around and then disappeared. Edinburgh Castle is open daily, 9.30 am to 6 pm in summer, and 5 pm in winter. More details at www.edinburghcastle.gov.uk. Balmoral Castle was the gift of Prince Albert to his wife, Queen Victoria, and in the mid-1800s it was enlarged to cater for their growing family. Queen Victoria had fallen in love with the Scottish Highlands, and spent many happy times there. After Prince Albert’s death, one of Queen Victoria’s favoured companions was John Brown, a servant at Balmoral. John Brown’s ghost is sometimes glimpsed in the corridors, and it is said that HM The Queen, who has her summer holiday at Balmoral every year, has encountered him. The website Haunted Rooms reassures us that “he is said to be always wearing his kilt.” I am relieved to know that, and I would imagine that Her Majesty is quite thankful, too. The Estate grounds, gardens and the Castle Ballroom are open to visitors from the beginning of April to the end of July each year. 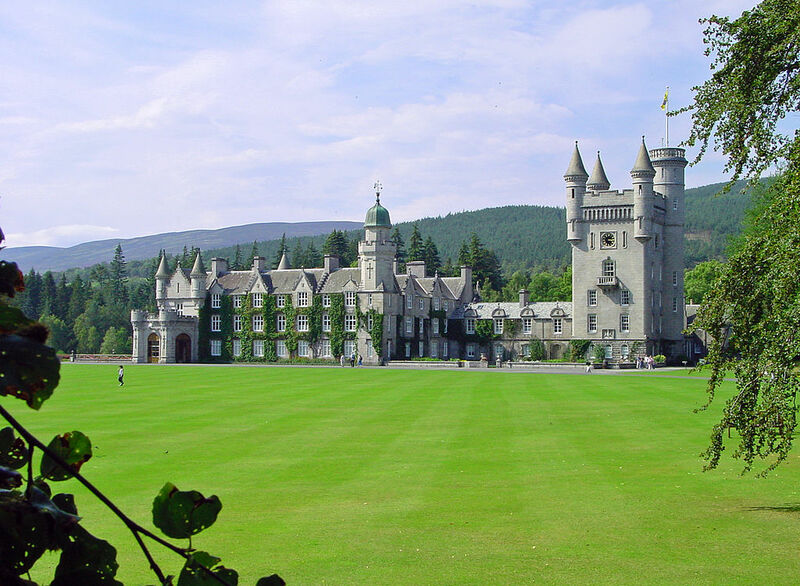 Balmoral is closed annually between August and October, as the royal family are in residence. There are guided tours at weekends during November and December. Full details at www.balmoralcastle.com. Few castles look quite so haunted as Linlithgow, with its shattered, roofless shell and gaping holes for windows. Linlithgow has been the home of many Scottish monarchs, and both James V and his daughter, Mary, Queen of Scots were born here. 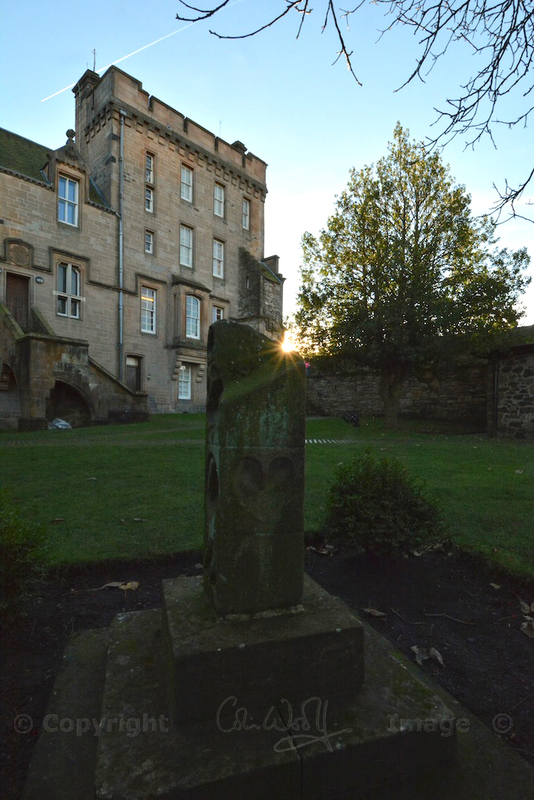 Queen Margaret’s Bower is a tiny stone room in the highest turret, named after the wife of James IV. From here, no doubt in the bitter cold, she watched and waited in vain for her husband’s return from the Battle of Flodden. No wonder her ghost has been glimpsed there. Another apparition, ‘the Blue Lady’, has been seen walking from the Palace towards the nearby Church of St Michael. She was witnessed by a custodian in 1973, and a number of visitors have also seen her; a rustling of skirts has sometimes been heard at the same time. It’s interesting to note that she has been seen mainly in April, and occasionally in September, but always around zolpidemsleep.com nine in the morning. 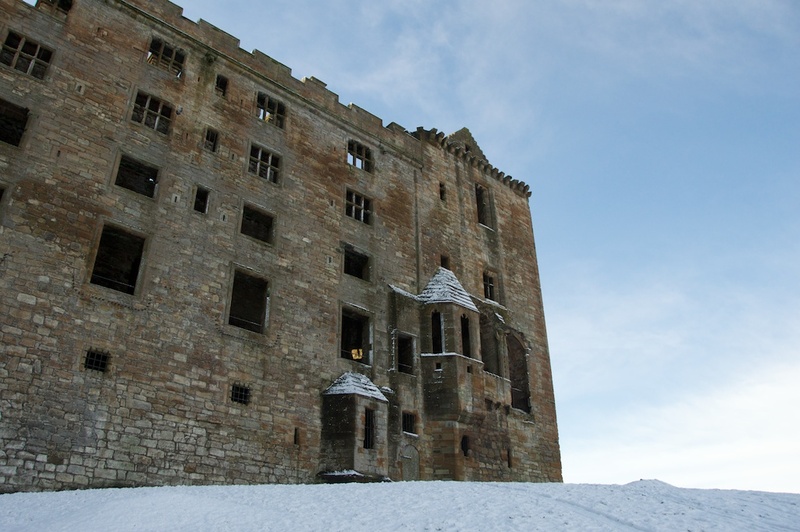 Linlithgow Palace is open daily, from 9.30 until 5.30 in summer and 10.00 to 4.30 in winter. On the day that we first visited the Palace, which was in April, the shadows were already getting darker by late afternoon, giving the rooms an eerie atmosphere. Colin and Verity ventured down into the kitchens and dungeons but I decided to stay above ground. 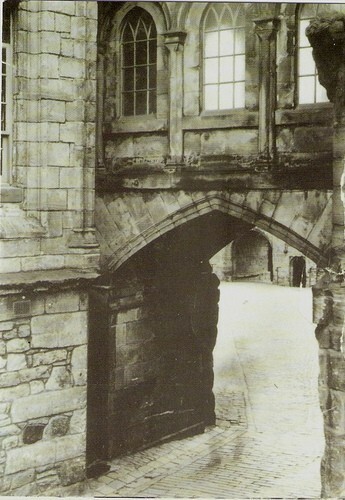 You can find out more about Linlithgow Palace at www.historicscotland.gov.uk or in this feature on The Hazel Tree. Historic Scotland organises ‘fright nights‘ at Linlithgow during late October and early November. Sitting atop its own rocky peninsula with the waves of the North Sea pounding at its feet, Dunnottar is one of the most spectacular castles I’ve ever seen. It would be almost disappointing to find that it has no ghosts – but, of course, it has plenty! A girl in a plaid-type dress has been seen in the remains of the brewery, while a tall man of Scandinavian appearance has been witnessed going into the guard room by the main entrance. A ghostly deerhound roams the grounds, and the sounds of a meeting in Benholm’s Lodging have been heard, when the building was empty of people. Dunnottar Castle is open in summer from 9 am to 6 pm, and in autumn/winter from 10 am to 5 pm or sunset, if earlier. The castle is occasionally forced to close in high winds or heavy rain. You can read my full feature here on The Hazel Tree, or visit www.dunnottarcastle.co.uk. If nothing else, Stirling can add two more colours to our spectrum of spectres: a Green Lady and a Pink Lady. In my mind, the name ‘Pink Lady’ conjures up some of the great scenes from ‘Grease’, but I’m guessing that this doesn’t have much to do with the dark chambers of Stirling Castle. The Green Lady is thought to be the spirit of a lady in waiting who saved the life of Mary, Queen of Scots when her bedclothes caught fire. The maidservant died in the blaze. In addition, staff and visitors at Stirling Castle have reported seeing a ‘Highland soldier’ in full traditional costume. A surveyor believed that he had captured him on camera in 1935, long before the advent of PhotoShop. Here is the link, should you wish to inspect it. 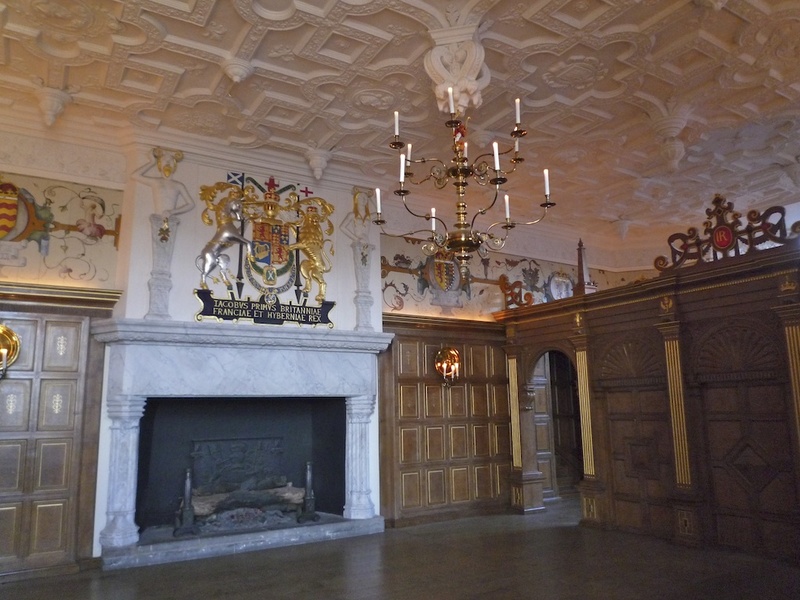 You can read my full feature on Stirling Castle here on The Hazel Tree, or go to the Castle’s website for up-to-date visitor information. If you fancy scaring yourself, there’s a company offering a ‘Stirling Ghost Walk‘ around the historic old town, in the shadow of the castle. We end our tour at Eilean Donan Castle on the shore of Loch Duich. Eilean Donan was once a stronghold of the Clan Mackenzie, who were involved in the 1719 Jacobite uprising. Garrisoned at Eilean Donan were some Spanish soldiers, supporting the cause of James Francis Edward Stuart, ‘the Old Pretender’; but the castle was bombarded by government forces and the Spaniards were put to death. One of them apparently still lingers in the area that is now the gift shop, with his head tucked under his arm. An apparition known only as ‘Lady Mary’ is sometimes seen in one of the bedrooms. Reassuringly, the present custodian of Eilean Donan has said that he has been through the castle at all hours of the day and night, and never felt a presence in any of the rooms. 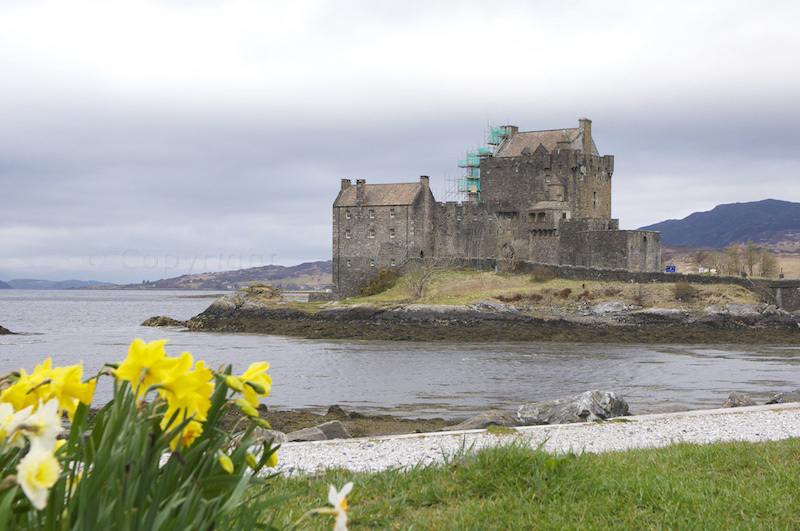 For opening times and admission prices visit www.eileandonancastle.com. That’s enough ghostly encounters for one post! What do you think about Hallowe’en and hauntings in general? Have you had any supernatural experiences? Thank you very much, Ed! I am enjoying your blog posts, too. You would love all these castles, I am sure! Wonderful tour and stories, Jo, very interesting. The settings atop a rock is spectacular!. Thank you, Carmen! Yes, there is no more spectacular setting than Dunnottar. It’s an amazing place! Linlithgow Palace is a place I really must visit some time (ditto Dunnottar), but perhaps not on a dark stormy night on my own. Fascinating stories, and I liked the photo of the highlander you provided a link for. I once thought I’d seen a ghost, as a child, but it was more of a glowing light than a human form. I was in my bedroom and feeling scared for some reason, I think I’d had a nightmare, and then there was this warm glowing orb in the room that made me feel very calm. It didn’t stay for long, just a few seconds. Like lots of people, I’m intrigued by the idea of a veil between the spirit world and the world we inhabit. For years after they died I felt very connected to my grandparents. It was as if they were very close to me but in another realm. It was comforting and I can’t prove it wasn’t just my imagination, but I was convinced that they were near me. Friendly spirits seem to me a nice thing to have around. I think you’d like Linlithgow, although it is a challenge to photograph because it really looks like what it is – an ancient, burnt-out shell. I certainly would not have stayed there after dark. And Dunnottar is simply spectacular! I liked that old ghostly photo, too, I find that more intriguing than modern ones that could have been tampered with. That is a fascinating experience that you had when you were a child, and I’m glad to know the feeling was a reassuring one. It’s also a lovely feeling that you had about your grandparents. I think children are sometimes more sensitive and open to this kind of sensation than adults, because they haven’t learned to deny them, perhaps. Indeed this was very interesting. I do think there are connections between our world and the spirit world. Sometimes I will get the creepies or just an uneasy feeling about a place…unless it’s just a a long forgotten sixth sense we humans had as a course of survival. either way this was a fun read! I think you’re right about the sixth sense, David, and about the feelings that you sometimes get on entering a house (or castle!) Glad you enjoyed the read! Most interesting Jo! Thanks for compiling this nice list of ghosts. Thank you, please feel free to do so – glad you enjoyed it! Bacon, your last plan sounds the best! I’m with you! 🙂 Thanks for commenting! I would love to go castle haunting — fun! Oh, we can do both. Daytime for nice landscape-y photos. And, nighttime for the super heebeegeebees! The daytime plan sounds great. At night I would definitely be the one having the super heebeegeebies! Thank you, Lynne! I love these stories, which do add atmosphere to a castle! A ‘spook’ of ghosts perhaps? Or a ‘moan’? I am a sucker for a haunted castle, so I really enjoyed this! Speaking as the current inhabitant of a Scottish castle, yes, I am easily spooked – but I have learned to rein in my imagination in order to get on with daily life! I did try to leave a comment with a link to a post I wrote about Hallowe’en hauntings here at Castle Beastie, but it was not accepted. 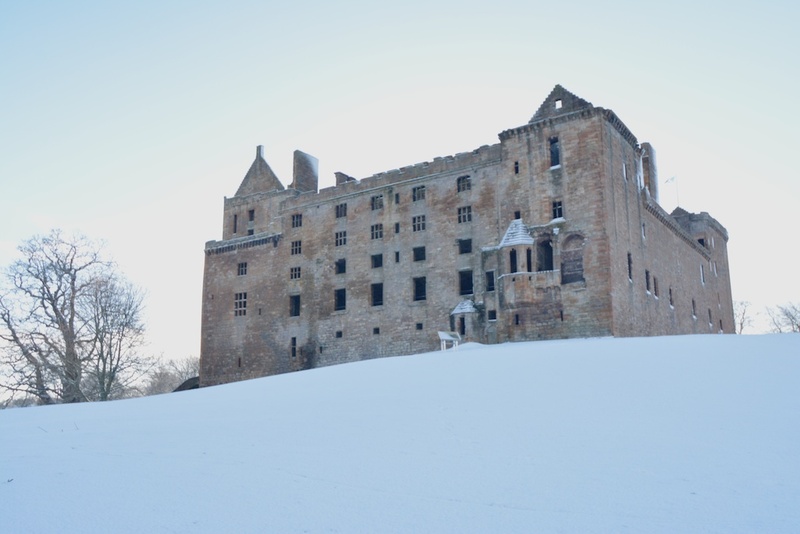 It is called ‘Is this the only un-haunted castle in Scotland?’ and I wrote it on 29 October 2011, if you’d like to take a look. Thank you, I have just seen that post and enjoyed it! I did wonder whether you’d had any experiences and I’m relieved to know that the castle is a peaceful place with only a few hints of spookiness. I think you are right about the veils between the worlds being thin in Scotland – I am not sure what it is, but perhaps it is because so many places have remained unaltered over the centuries. First of all, Hope you don’t mind my sharing this on facebook. What a wonderful and insightful article. Very informative as well. Thanks for sharing! I don’t think I would have gone to Stirling Castle or Linlithgow Palace if I had known that there where so many ghosts floating around! Although it would have been quite good to see the Pink Lady at Stirling! I’m sure you would! 🙂 The Pink Lady, for some reason, sounds less scary than the Green one. 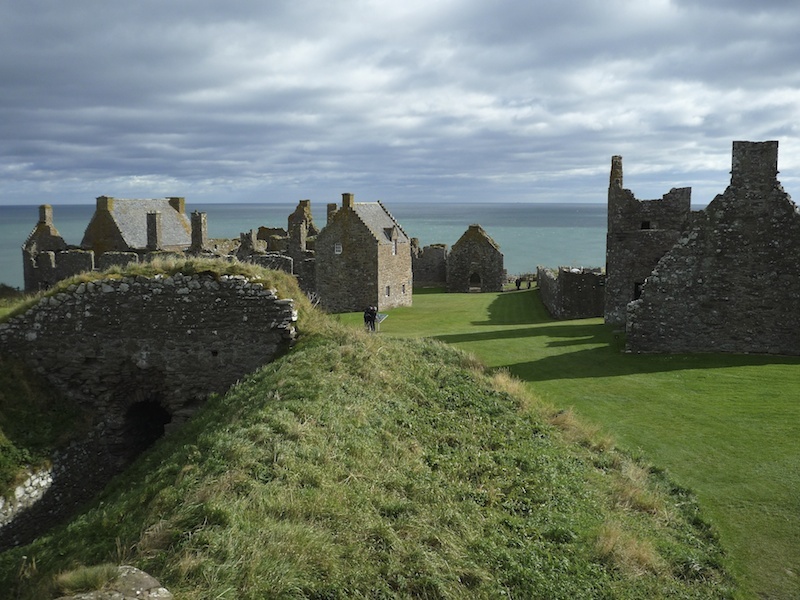 We must take you to Dunnottar, you’d love it! Love the Scottish castles! If no ghosts are to be seen, then the weight of history would be wonderful enough! So do I love them! They all have their own unique atmosphere. I just love imagining the people who have walked there, what they felt, what they thought. Glad you love them too! I have had the Castle bug as long as the Lighthouse bug – I hope to produce books on both subjects in times to come we shall see – I think the key connection to all these locations is not just the castle but it’s setting adds immensely to the appeal. I hope you do, Scott, that sounds like a worthwhile project. I do love all castles, regardless of the setting, but I have to admit that the likes of Dunnottar and Kilchurn are spectacular! I must visit both Duffus and Ardvreck – in fact, I would love to have a good look at Moray and Sutherland, as I don’t know the area well at all. Good luck with your plans! Great tour with spectacular pictures and interesting info! I’ve always been particularly fascinated by Stirling Castle and couldn’t help but notice your questions regarding the Pink Lady- it’s possible it could be Mary of Guise, who was widowed when her daughter, Mary Queen of Scots, was about a year old- and an extremely strong, interesting woman in her own right. Thank you very much, Diana! You could well be right about the Pink Lady. I get the impression that any ghost of a woman in period costume is assumed to be Mary, Queen of Scots (and she stayed in so many houses and castles, after all!) but Mary of Guise is a very good candidate too. I have always found her extremely interesting – as you say, she must have been a very strong and intelligent woman.